Drinking wine can be said to be a pursuit of leisure in addition to it being an art form, and seasoned veterans will tell you that the wine is best enjoyed at the right temperature and drunk from the right glass. 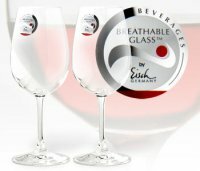 The Breathable Wine Glasses aim to make your life easier in this case. The Breathable Glass designers have come up with a top secret formula that not only greatly improves the “nose” (smell to you and me) of your wine, but renders any wine poured into the glass ready for drinking within a few minutes. This means you can enjoy that vintage bottle you’ve been hiding in the cellar for the last few years without clearing a huge window in your schedule. A few minutes in one of these glasses is the equivalent of it sitting in a decanter for one to two hours, and without any change to the wine’s character and structure. Of course you don’t need to be a wine lover to appreciate the genius of these glasses as they will work just as well with spirits and fruit juices, lifting the flavors head and shoulders above normal glasses. Discover just how great your wine can taste with the most revolutionary wine improver to hit the market in years. Perfect for those of us who are always living life in the fast lane and can’t be bothered to wait longer than expected before enjoying the fruits (juice) of their labor. They retail for £24.99.